Virgin Vintage Viewings is a series in which we view older well-known/classic films for the first time. Pairing these two titles was accidental. I chose randomly from my vast queue of unseen gems, and I was struck by how oddly similar they were. 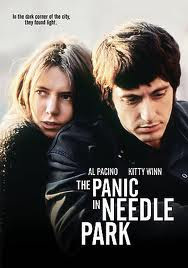 At first glance, there is no apparent connection between Ulu Grosbard's Straight Time (1978) and Jerry Shatzberg's The Panic in Needle Park (1971). When I did a little research before writing this up, I did discover a common thread: these are the last films that Dustin Hoffman and Al Pacino starred in, respectfully, before hitting major milestones in their impressive careers. For Hoffman, it was his final film before becoming an Oscar winner (for the heartbreaking Kramer Vs Kramer). For Pacino, he went from Bobby in The Panic in Needle Park to Michael Corleone in The Godfather. But more to the point, these are two films about the power of addiction. The Panic in Needle Park focuses on a common one: drugs. Pacino broke into Hollywood with this film, a dark, quiet drama about a drug addict who falls for a comely drifter. The two lost souls connect, but when Bobby goes under his drug-induced spell, Helen (Kitty Winn) is alone and miserable. So she begins using - and whoring - in order to be with Bobby through all kinds of altered states. Ain't love grand? This is a difficult film to watch. Lots of extended scenes and close ups of addicts shooting up, distributing, tricking, robbing, stealing, you name it. The title of the film comes from a period in the 70's where cops were cracking down on drug dealing in NYC, sending addicts to a "panic" in which they'll do anything - and I mean anything - for a fix. Watching the film's two lovebirds careen wildly from happy and energetic to desperate and angry - and back again - grew tiresome and repetitive towards the final act. You can pretty much guess how the film will unfold; it's just inevitable that these people have nothing else to live for. I think Schatzberg knew the fate of Bobby and Helen would be pretty clear, so he did the smart thing: he closed the film two scenes before the end of the story. This actually works because there's nothing more boring than knowing exactly what happens next. Schatzberg didn't need to spell out the obvious. As tough as this film is to watch, it's remarkable to see what an expressive actor Al Pacino is. This is Pacino making his leading role debut, and what an entrance it is. The man is a legend; Hollywood without Al Pacino is like movie theaters without popcorn. He has made some indelible marks in this industry. Needless to say, he's terrific here, a fresh face and a bundle of nerves. Kitty Winn also won raves for her performance here. It's a brave, auspicious debut. She only appeared in a few more movies before dropping out of the business altogether. It's a shame. The camera loves her and I think she could have pulled off a wide-ranging career. 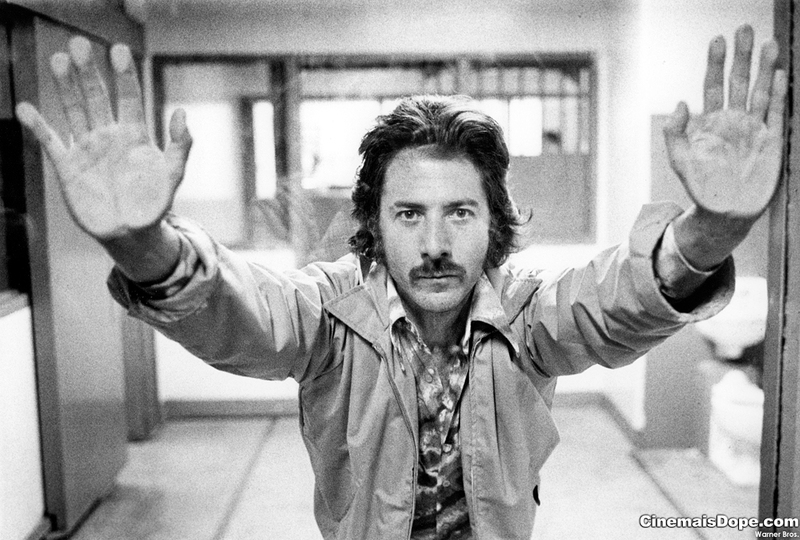 If you're going to talk about great actors, though, you can never not mention Dustin Hoffman, an all-time favorite of mine. He's always disappearing into his roles, and he's always on. He is such a transformative actor, a man who consistently creates memorable characters film after film (see: Michael Dorsey/Dorothy Michaels, Ratso Rizzo, Raymond Babbitt, or more recently - and just as brilliantly - Guisseppe Baldini from Perfume: The Story of a Murderer). He's Captain Hook! Mumbles! No wait, he's Lenny Bruce! The man is a chameleon. Straight Time uncovers a gem of a character: ex-con Max Dembo. He's a small time crook, addicted to the life of crime. But he wants to go straight. He makes an effort: gets a new job, finds his own place, meets a new girl. He's convinced he can turn himself around. But the influences around him pull him back in. First, his parole officer (the fabulous M. Emmett Walsh, character actor extraordinaire) is a greasy prick who would love nothing more than to see Dembo back behind bars. Walsh resembles authority, and as an outcast who has resisted authority all of his life, it's not easy for Dembo to play by Walsh's rules. Hanging out with old friends, including the wonderfully cast Gary Busey and Harry Dean Stanton, makes it tough for Dembo to resist the urges of robbing jewelry stores and stealing cars. His new girlfriend, Theresa Russell, resembles the lifestyle he only dreams of, but is she enough to change Dembo for good? Straight Time is a methodical, slow moving character drama that doesn't focus too much on plot. It asks a simple question: can an ex-convict forever change his ways? Jeffrey Boam's thoughtful script zeroes in on the addictive nature of crime and how easy it can be to revert back to your old ways. Did these two guys really have a chance at making it straight? Like Bobby over at Needle Park, maybe Dembo's fate was sealed from the start. Straight Time's finale wasn't as cryptic as Needle Park's, as the closing credits showed us that Max Dembo belongs exactly where we left him. Not everyone gets the hopeful reprieve of a cut-to-black. I never heard of either of these movies. I'll seek them out now. They both sound interesting. Drew, you should check them out. I wouldn't classify them as great films, but if you're a fan of Pacino or Hoffman (and really, who isn't? ), they are worth a look. I promise you they are better films than Trash Humpers. Excellent review of Straight Time. What a brilliant actor Hoffman is. This is one of those films I wanted to get into my top 10 of Hoffman's performances but in the end couldn't find a place for it. Haven't seen this in a long time though, I will have to dig it out. Dan - it's streaming on Netflix instant. Worth another look, if only to catch a brief, startling performance by a very young and thin Kathy Bates!